Any time that the ball is dribbled from or across the midline, a backdoor/fill or flare is created. In this diagram, 4 is denied, so as 3 dribbles at him, he cuts backdoor. 1 steps up and fills the spot as the receiver. If 4 doesn't get the ball on the back cut, he posts up. 1's first look is to get 4 the ball on the block. 5 has come up to set a flare screen on 3. This is now a top flare situation. A good rule of thumb is that if someone dribbles at you and the defense is between you and the ball, or if you can touch the defense, you back cut. If 3 dribbles across the midline and 4's defender is sagging to the middle, 1 sets a flare screen for 4. 3 passes to 4. 1 would now roll to the block on 3's pass to 4. 5 comes up, and now the offense is in the same top flare situation. A top flare situation occurs in several cases. One common occurrence is a result of a backdoor/fill or flare situation. 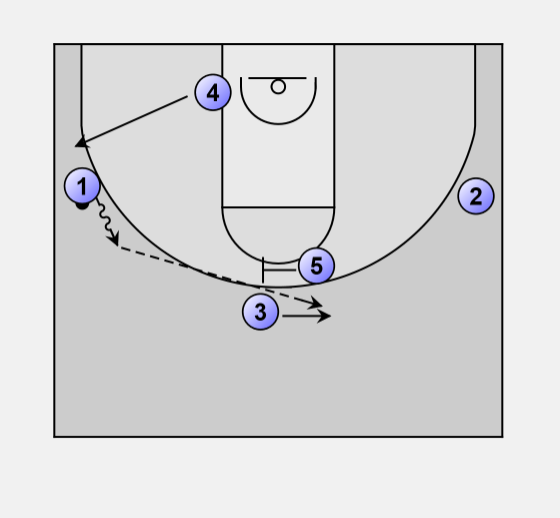 Here, 3 has dribbled across the midline and 4, who is denied, has cut backdoor. The backdoor pass isn't there, so 3 passes to 1, and 5 has moved up to set a flare screen for 3. Again, 1 looks at 4 in the post first. If 4 isn't open, 1 dribbles up and passes to 3 who flares off of 5's screen. It is important for 1 to dribble up toward 3. First, it creates a shorter pass. It also flattens the angle between 1 and 3, making the flare screen more effective. As 1 dribbles up, 4 moves out of the post. If 3's defender gets screened by 5, or goes under the screen, 1 passes to 3. 3 could shoot the three-pointer, he could drive to 2's side, or he could pass to 2 and cut to the basket. 5 would pop up top, and "open" would begin. If 3's defender fights over the screen, 3 cuts to basket, 5 steps out, and "open" begins. On any cut to the basket in this situation, if 3 doesn't get it, he will fill the corner on 2's side. A top flare will always move into "open" unless a shot is taken.